I’ve already shared the amazing lime soup, unforgettable Potrada Feliz, and the life changing chile rellenos tacos. The problem with Mexico is that there is just too much food and not enough time to eat it all. I loved my time in Campeche, Valladolid and ate at great restaurants in Merida. I will be back. The tamale has been around for nearly ten thousand years and is popular throughout Latin America. They are made from masa, a starchy corn-based dough that is steamed or boiled in a leaf until solid. They can be filled with any assortment of meat, cheese, vegetables etc. The ultimate comfort food, Mexico has almost 1000 different varieties of tamales depending on the region and I plan to eat as many as I can. I found my first tamale from a vendor at the food market. The price depended on the size and I chose a smaller one, slightly larger than a deck of cards, for 65 cents. The filling was simply tomato based with chicken, accompanied by a baggie of hot sauce to spice things up. I ate them every day is Merida, which left more room in my budget for too many pitchers of beer. 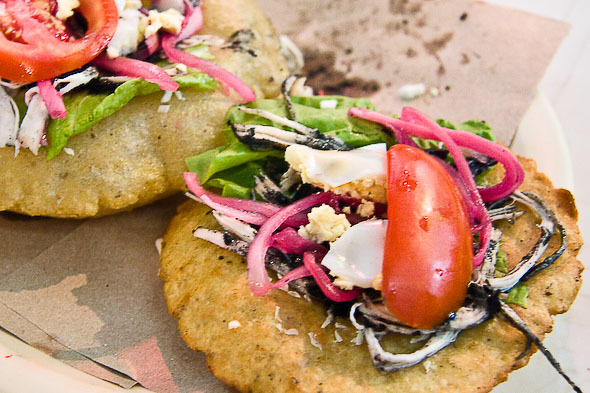 Originating in Merida, Panuchos are small fried corn tortillas garnished with black beans and topped with turkey or chicken, lettuce, avocado and pickled onion. As always, hot sauce or habanero peppers are availble as an additional topping. Many street vendors and restaurants sell them throughout Merida and the Yucatan. Unlike some other street food it was light, fresh and didn’t have the heaviness of typical fried food. It’s often an appetizer, but like most food in Mexico, it was enough for lunch. 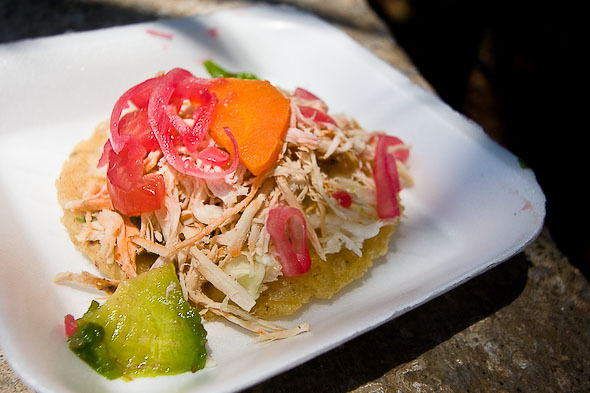 Very similar to panuchos, another very traditional dish from the Yucatan are salbutes, a deep fried soft tortilla topped with chicken, turkey or pork, onions, tomatoes and lettuce. The corn tortillas fry in oil until they crisp and are topped with meat, tomato, lettuce, sliced avocado and pickled onion. As delicious as they are, I would consider them as treat as they are deep fried. I ate my first salbute in a market stall in Campeche where the vendors shout out the menu to entice people to sit at their table. Lunch was somewhat eventful as the women laughed at me for photographing my food. While my Spanish was weak, I did understand one cook mocking another that no one was taking photos of her food. Pork is central to every great celebration in Mexico, but you don’t have to go to Mexico to try it. Check our this recipe for Yucatan style Mexican pulled pork which can be served on tortillas as tacos or on a soft bun as a torta sandwich. Yummm tamales. All your posts do is make me miss California and all the great Mexican food we have! I hope that you’ll still be in Mexico for Cinco de Mayo- I’d love to see pictures from that! MMM I love a good tamal. I knew they were big in the Mexican diet but didn’t realize how many other countries have a tamal or tamal like food. Peru had these weird green ones with no filling in the center, but it was still delicious. Did they have any bacon tamales? Oh if there are bacon tamales or even pork tamales you will see them. Love street food anywhere in the world. I just always make sure locals are eating from that particular stall/table/truck too. Oooh, I’ll take the panuchos please! It’s making my mouth water! You do the best food posts of anyone around! My mouth is watering. I lived with a mexican in New Zealand and he cooked for me all the time. Needless to say I gained some pounds while there haha. 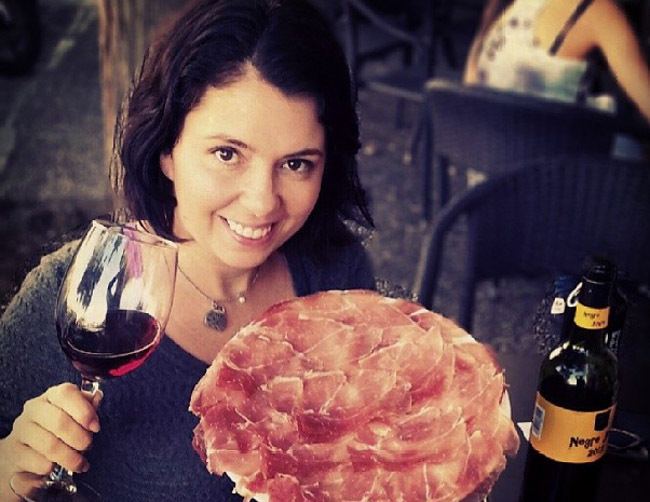 Love your descriptions as much as your food photos. Really great shots. Yum…good stuff Ayngelina. Be careful trying the 1000 varieties of tamales as you’ll need to book 2 seats on your flight back home. I’m so impressed you can speak enough Spanish to order and then understand some of the banter. Impressive. I want to try all of those dishes. Would you believe I’ve never had a tamale? Mmmm, panuchos looks delicious. Nom nom. Oh I’m afraid when I was in Mexico I couldn’t speak very much Spanish at all. At that time I just pointed to what I wanted but honestly all the food was delicious so you couldn’t go wrong. When I see you are writing a food post, I back away from my desk slightly so that I don’t ruin an expensive bluetooth keyboard by drooling all over it. Ayngelina, I cooked my wife the cerviche recipe you recently blogged. Great, turned out very tasty, had to substitute a few things but it turned out alright, very filling. That should read “Now for the Tamales” !! Perhaps my fave food photos from you yet?! Can’t quite pick a favorite. I was in the Yucatan a couple of months ago, and my favourite were the panuchos! Such a great place to eat!